Hope you have read the Edition-I and it has met your expectations. We have put our heart for making this edition live. We tried our best to make it best, but in reality its readers who made it best. 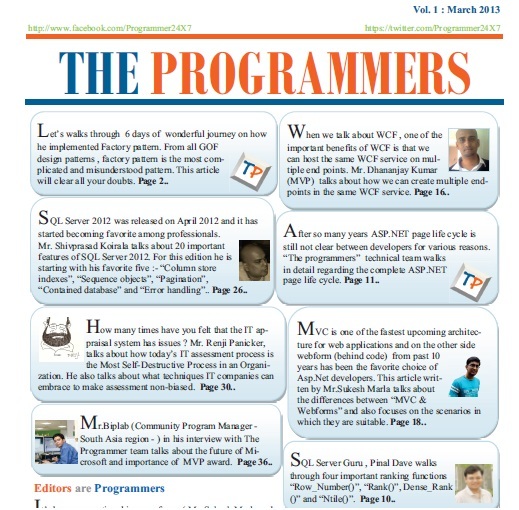 First of all I as a publisher of The Programmer newspaper would like to thank each and every one of you for making this edition a successful story. We have reached more than 1000 developers till now. I would like to thank Questpond team for helping us distributing newspaper across India. Finally my special thanks to authors of Edition-I Pinal Dave, RenjiPeniker, Dhananjay Kumar, Shivprasad Koirala and me ( even I was the author in Edition-I :) ). 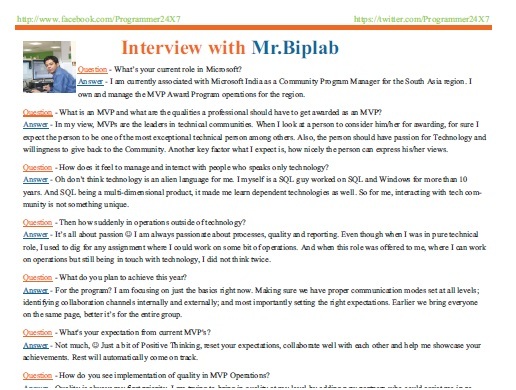 Thanks Bipalab Paul for your valuable interview. In spite of your busy schedule you managed to take some time out and added a valuable input to the edition. Now it’s time to feel the smell of second edition. It’s only few steps away from your door step. It’s more exciting and improved. This time we have lots of surprises for you, with more number of technical and non-technical articles. Hope you will have fun in exploring this edition. And we will deliver paper to your doorstep. Please send me a copy of the second edition, I'm really excited to see what's there inside this time. Please send me copy of both first and second Edition if you can. I am really passionate and excited to see whats inside. I emailed you my address at sukeshmarla@gmail.com from ankur@studyhelpline.net. Is it possible to get soft copy of first edition. Sir what if don't have a blogging site? then how can we review? although we can share if on facebook etc. which i've done. Now how i can have a copy? Wot if i dont have a blog ?? What to do if i dont have a blog of my own ? Shared here https://www.facebook.com/tare.supreet?hc_location=stream would love to review & write more in detail on my blog. would love to review the full copy & post a detailed review on my blog. 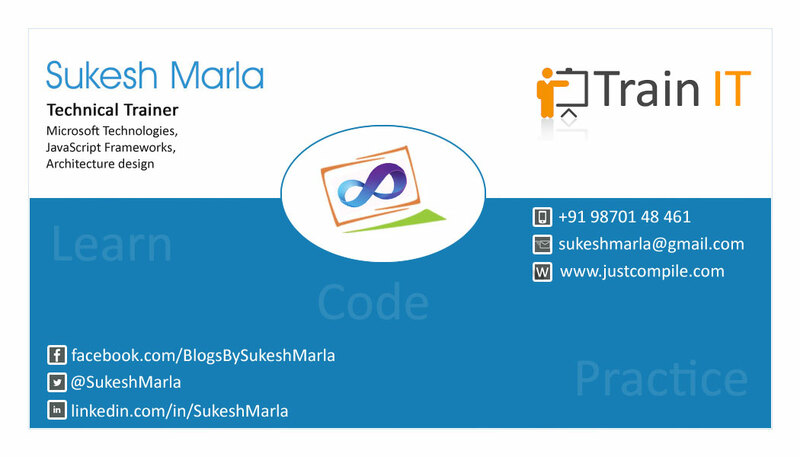 Thanks..Send me your Permanent address at SukeshMarla@Gmail.com and we will deliver you the same. Hi, I have shared and sent you the link as well as address. can i get the copy? 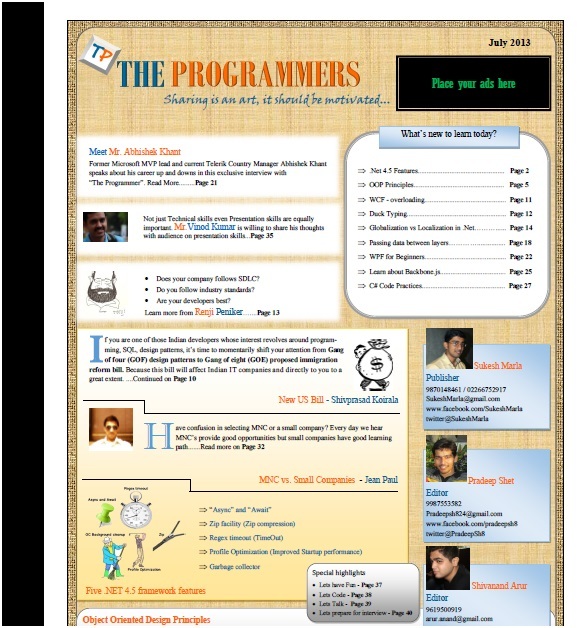 and have sent you a mail to your id along with my address, eagerly waiting for the second edition of "The Programmers"
https://www.facebook.com/tuhinpaul123?hc_location=stream .... I too Shared it.. Its a great start,thanks for this initiative. Good luck... Hope this trend catches up well among us. Please send my hardcopy. Mail sent to your email id. I just loved the first edition....I learned the Factory Pattern Approach & MVC Architecture from the first edition. It was amazing. I have shared your link on below address. Kindly send me second edition as well. I have completed 1st edition. Thats why i will expect second edition. Kindly send me a copy. Can I get the Editions ? please find the link below. I have completed 1st edition.Now i am very excited to see second edition.Kindly please send a copy through my home address. As per your trailing mail.I have shared your given link in my facebook profile and also replied to that mail.Please send me a copy of that The Programmer-II. i am just fresher and have recently completed post graduation in software engineering, besides that i did go through your .net videos which really helpful in understanding the concepts in the easiest manner. At last, i mailed you and share the link on fb(https://www.facebook.com/munna.lal.71271). kindly share your newsletter as i am eager to read that.